I made this dress for our ten year anniversary trip to London and Paris last year. You can see my inspiration for this dress here (and one of the key factors that led me to create The Monthly Dress Series). Last year I made this dress, and it is still one of my favorite dresses to date. I fell in love with the embellished blush and pink hand sewn tiny flowers on the dress overlay when I was in Mood. And I knew I had to make something special with that fabric. I’ve had many requests for a tutorial for this dress, so (just one year later), here it is! The Behind The Dress: April episode was supposed to go live today, but we are still making a few tweaks on that video. So I’ll have that for you here TOMORROW! (you can see the Behind The Dress episode for March here, February here, and January here). It is really really fun, so I hope you check back and watch it! The shoot for The April Dress was absolutely magical, and I have tons of behind the scenes secrets on how we were able to capture those images and the whole process for making the dress. Here’s The Paris Dress Tutorial! 2 yards of fabric lining (this can be a poly spandex blend, or any fabric that has a nice soft drape to it. Stiff cotton, or fabric that is a lot thicker than your overlay fabric won’t work well for this dress. If you don’t know how to sew but are interested in learning, make sure you check out my online sewing courses for beginner and intermediate sewers. 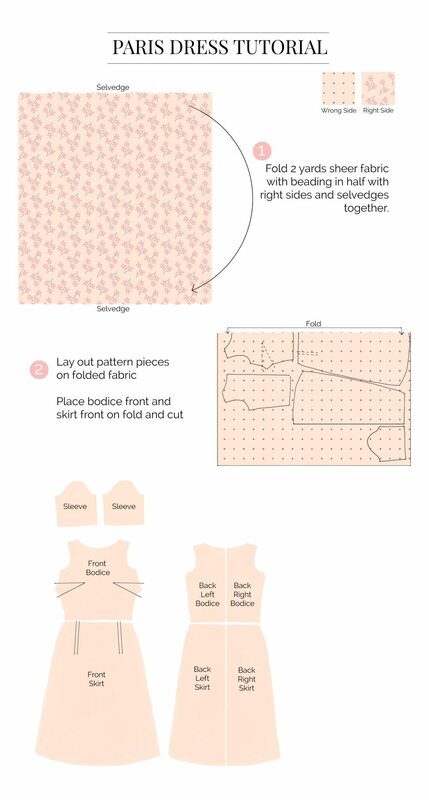 How do you get the measurements for the pattern pieces? Beautiful dress and beautiful illustration! How do I get the pattern? I don’t see a link or anything with the tutorial. I love this dress at the first sight when I saw it. Thank you for sharing the tutorial! I hope I could find a suitable overlay fabric.